Well, for an entremet, I guess it is fairly simple. There are only four components: hazelnut cake, caramelized hazelnut crunch, white chocolate and coffee mousse, and a butterscotch glaze. However simple, together these elements are magnificent. The hazelnut cake is unbelievably soft and fluffy—it compresses with the lightest of touches. Speckled with contrasting dots of hazelnut, it supports a layer of caramelized hazelnut pieces. This layer, however thin, provides a much needed juxtaposition of texture to the otherwise creamy cake. With every bite, the coffee notes of the mousse fade away to reveal the earthy taste of caramelized hazelnut hidden within. It’s wonderful. Here’s the deal: this cake is amazing. I don’t know how else to put it. When I first tried it, I was shocked at how good it was. I know it looks scary. I’m looking at the photo right now and I am slightly scared. The good news, however, is that it’s not that hard. It’s not that scary. The hazelnut cake is pretty much made in a food processor. If you can fold ingredients together and know how to press a button, that layer should be a piece of cake (ha!). The caramelized hazelnut layer is also quite easy to do. Unlike with most caramels, you don’t need to watch for it to get to the proper colour. You don’t even need to measure its temperature. All you have to do is stick the mixture in the oven for ten minutes. If you can set a timer for ten minutes (I really hope you can), the caramel should be a piece of caramel. Okay, that pun didn’t work out as well as the previous ‘as easy as a piece of cake’ pun. Sorry. But, I guess, if you do set the timer for ten minutes the mixture will turn out to be a piece of caramel. Here’s hoping, because caramel can’t get any simpler. The mousse is also pretty easy. All that’s involved is folding a few ingredients together. Just watch out for the glaze. That’s probably the trickiest part. To make this cake, I slightly modified Antonio Bachour’s recipe in his book Bachour for “Valrhona Ivoire Coffee Entremet with Dulcey Glaze”. 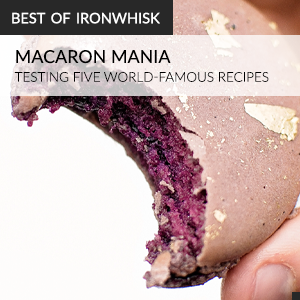 His book is targeted towards pastry chefs, and so the recipe called for some hard to find ingredients. As I was not baking for 200 people, and didn’t have access to many of the ingredients, I substituted a few things and scaled the recipe down. This meant that I had to replace Valrhona Dulcey chocolate (it’s a caramel coloured and flavoured chocolate) with butterscotch chips that I found in the grocery store. Naturally, the cheap butterscotch chips behaved quite differently than premium chocolate Bachour uses. So, they gave me a bit of trouble with his glaze recipe. It’s okay though. It ended up okay once I added some more oil and water. I also cut down the sugar in his recipe. I’ve been doing that a lot recently for American-sourced recipes. I’ve found that many American (North and South American) desserts just have way too much sugar in them. They’re too sweet for me. All I taste is sugar. I much prefer a backdrop of sweetness to complement the starring flavours of the dessert. 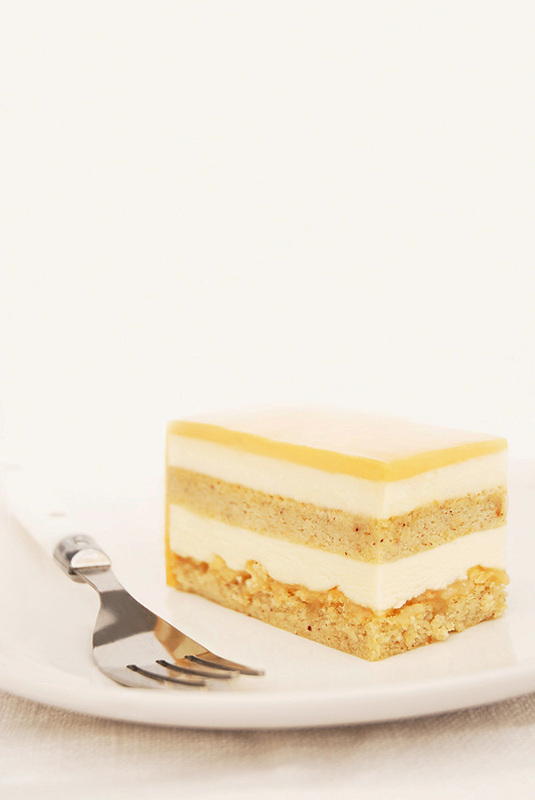 Anywho, I highly suggest that you make this entremet. It’s great because it’s not too hard, but very tasty. At least within about 48 hours of glazing anyway, since after that the crunchy hazelnut layer gets soft and the textural contrast goes away. I recommend eating it soon after glazing. If you don’t have a mousse or pastry ring, which is needed for making entremet cakes, make one out of tinfoil. Yup, really. This is actually the first rectangular entremet that I made with a pastry ring. Before, I just made them out of tinfoil. It works quite well (see here for an entremet I made without a pastry ring). Coffee, hazelnut, and caramel entremet with layers of hazelnut cake, white chocolate and coffee mousse, crispy caramelized hazelnuts, and butterscotch glaze. Preheat oven to 180°C (350°F) and line a half sheet pan with parchment paper. In a food processor, grind together the hazelnuts, 70g sugar, salt, and eggs. If you’re starting off with whole, toasted hazelnuts, then grind them with the sugar and add in the eggs once ground. Add the butter and process until smooth, scraping down the sides of the food processor, as necessary. In a large bowl, whip the egg whites and the 30g of sugar to stiff peaks. If you’re using a KitchenAid stand mixer, this is about 9 minutes at speed 6. Fold the hazelnut mixture into the egg whites, being careful not to deflate the egg whites too much. Fold until smooth. Spread onto a half sheet pan lined with parchment paper. Once cooled to room temperature, cut out two 18cm (7’’) squares with your pastry ring. In a small saucepan, bring the sugar, butter, corn syrup, water, and salt to a boil. Stir in the chopped hazelnuts and pour onto the parchment paper-covered pan. Refrigerate until cool (about 10 minutes), and then bake for 10 minutes. Let cool for a few minutes before cutting out a 18cm (7’’) square with your pastry ring. You may find it useful to hit the pastry ring with something (e.g. a rolling pin) to cut the caramel, as it can be a bit hard. Bring the coffee beans and the milk to a boil in a small saucepan and then set aside to infuse for at least 15 minutes. Meanwhile, combine the gelatin and the water in a small bowl and let sit for at least 5 minutes. Strain the coffee beans out of the milk, warm up the milk to a simmer, and then stir in the gelatin until dissolved. Whisk in the melted chocolate until smooth. Cool for 10 minutes before folding in the whipped cream. Place the pastry ring on a parchment paper-lined pan that will fit into your freezer. Place a layer of hazelnut cake at the bottom of the ring, followed by a layer of the caramelized hazelnuts (it’s okay if they break a little), and half of the mousse. Add another layer of cake and the remainder of the mousse, smoothing it out as necessary. Place in the freezer to chill overnight. Combine the gelatin and the 20g of water in a small bowl and let sit for at least 5 minutes. Bring the cream to a simmer and then stir in the gelatin, until combined. Whisk in the melted butterscotch chips. Add the 25g of water and the oil and process with an immersion blender for a few seconds, until smooth. Let cool to 46°C (115°F) before using. Remove the cake from the freezer and the pastry ring by briefly warming up the sides of the pastry ring with a flame. Transfer the cake to a cooling rack on top of a sheet pan. Pour the glaze over the sides of the cake until well-coated, and then pour the glaze onto the middle of the cake. If you run out of glaze, warm up the glaze that dripped down to the bottom of the pan and use it. Let cool at room temperature for about ten minutes, and then slice as desired. This cake should be stored in the fridge and is best eaten within the first 24 hours after glazing, as after that the caramel-hazelnut layer loses its crunch. You had me drooling with this one. Can’t wait to try it. I don’t have coffee beans on hand so I was wondering if I could substitute instant coffee in the milk or half brewed coffee and half milk? Hi Debbie, you can definitely use instant coffee in the milk instead! Thanks Ilan for the quick reply, I will definitely be making it sometime this summer. Wow! This cake looks amazingly good. Beautiful cake. Plus I love anything with hazelnut! This is probably weird, but I’ve always wanted to make an entremet. They look so pretty and all the different flavors and textures sound wonderful together. Yours is stunning! This entremet looks amazing!!! I have one question: I live in Italy, and it is a problem here to find butterscotch chips and the corn syrop, could you suggest me some substitutes for these products? I would highly appreciate your answer, thank you. Hi Marina! Butterscotch chips can be substituted for Valrhona Caramelia chocolate (and you’d get a better result). As for corn syrup, I don’t have a great substitute. Have you considered ordering online? This looks great, but I’m puzzled by one part of the instructions. The assembled cake sits in the freezer overnight, then the next day you remove it from the freezer, glaze it, and serve it 10 minutes later (!) Doesn’t that mean it will actually still be frozen when it gets served? You can defrost it and serve it later, if you’d like. Personal preference–it’s not fully frozen. Hey, thanks for the reply. I actually made a version after posting my question, and it came out beautifully (thank you!) It unmolded easily with a quick application of the torch. Then I glazed it and let it set in a cool room for 2 or 3 hours before serving. The result was, indeed, NOT frozen… it was perfect. Incidentally, instead of using butterscotch chips in the glaze, I used white chocolate, into which I stirred enough caramel (the soft, pourable kind) to get the color I liked. No added oil was needed. I made this for Christmas and it tastes fantastic. My glaze and cake look much darker. I sprinkled extra crunch on top. My crunch spread out a lot and was pretty thin. I am guessing that American butterscotch chips must be much darker than British. Took some tome to convert grams to cups and ounces. Have many requests to make again. As you said the glaze was difficult to get even. Took many coatings to get it thick enough – poured from baking sheet through strainer to use again. Would like to find a way to make a butterscotch glaze without using chips. I could not find that chocolate – is that what you used for the photo? My chips came out dark. I used butterscotch chips because I couldn’t get it easily either. But it should be available on Amazon (I just didn’t want to make the large purchase of kilos of chocolate). I realize it is probably too late now, but I used a square one! Thanks Ilan! This was a bit more complex than what i’m used to cooking but wow it was worth it! So delicious, me and the kids were in heaven. Only recently found your site so will be going through more recipes soon! I love entremets! Thank you so very much for sharing your wonderful recipe. Very few people will share their recipe for some reason so you have a friend for life. I found this lovely cake and made it for my family for Thanksgiving. Then I shared your blog with everyone too. You made my dinner table beautiful and my family well pleased with dessert. It means so much to me. Again many thanks for sharing your wonderful recipes and the stories with them. I love the way you write and describe your temptingly delishous deserts. And the use of. ” anywho” !! Keep at it and enliven this diabetics taste buds! Hi, just wondering why the hazelnut crunch mixture needs to be cooled before baking (step iv)? Good question. I’m not sure.. I was following Bachour’s instructions. If you try it without the cooling period please let us know how it works out! Hi no fluor în the cake ? Correct. The ground hazelnuts act like flour. Just made this recipe (exactly as printed) and it was a HUGE hit!! Gave some to a friend and he said “next time bring more!! !” Excellent dessert, well worth the time to make it. lovely recipe. i think the flavors are wonderful and compliment each other beautifully. What is the size of your pan? can this be made in a 9in round pan? If so, will the ingredients be sufficient to fill a 9′ cake? Does this cake assemble better in a cake ring or would a springform pan without the base do just as good a job? And if I can use the springform, would I need to do anything different to get a nice finish? Works better in a cake ring, but should still work in a springform pan! Same process. Ideally use a springform pan that has thin sides so it would be easier to remove the cake with heat. If i use instant coffee instead of coffee bean , how much should i put in ? Can I use a condensed milk instead of whipping cream for the glaze? I am trying to achieve a shiny finish rather than matte (based on your picture). Also, I have an 8″ round cake ring instead of cake square. Do I need to convert the measurement?